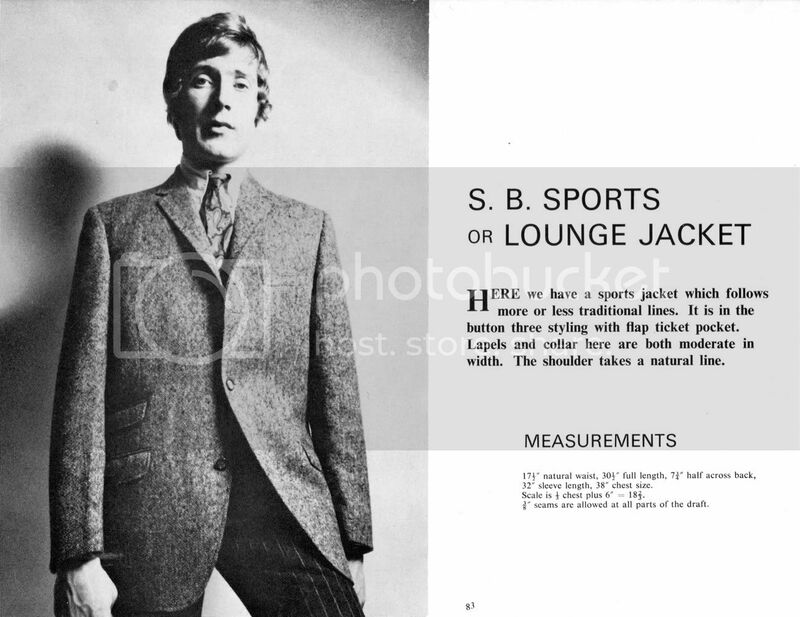 The following Tailor & Cutter lounge coat system comes from Advanced Practical Designing for Men's Clothing. For once, the publication date is printed in the book: 1970. Some of you will be pleased to see the presence of the side body, however there is another lounge coat draft in the same book without it! It represents what is probably the most recent Tailor & Cutter lounge coat system before the untimely demise of the journal around 1972. It represents the final word and swan song from The Tailor & Cutter. I am going to keep this most modern Tailor & Cutter lounge draft pinned, to replace the older Whife era version published in The Modern Tailor Outfitter & Clothier (MTOC) from 1949/52, as well as A First Course in Gentlemen's Garment Cutting. 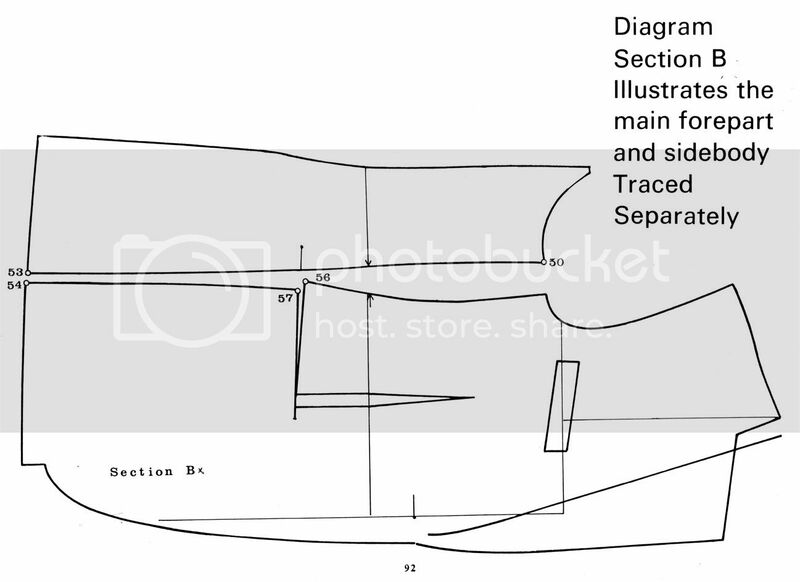 The older Whife era draft contains more information on cutting for corpulent figures. The corresponding Whife era sleeve draft can be found here. 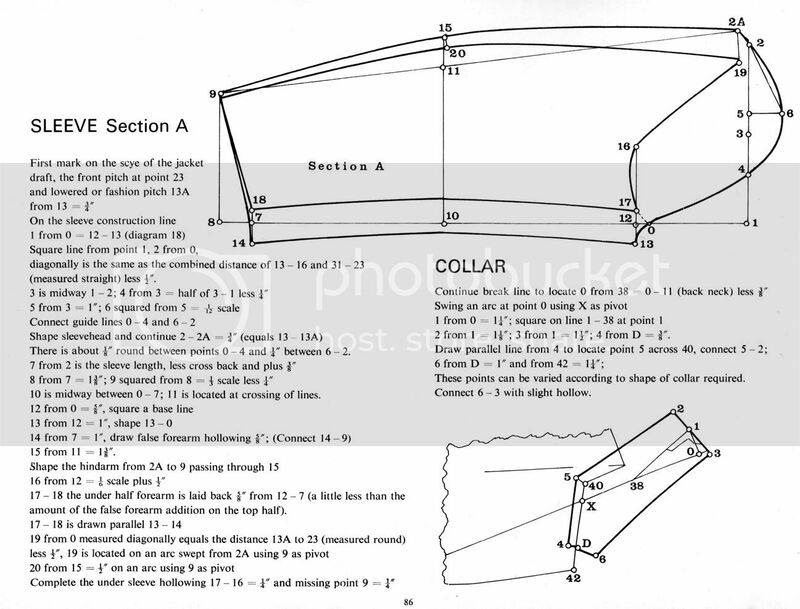 The discussion from the Whife era on cutting collars can be found here. 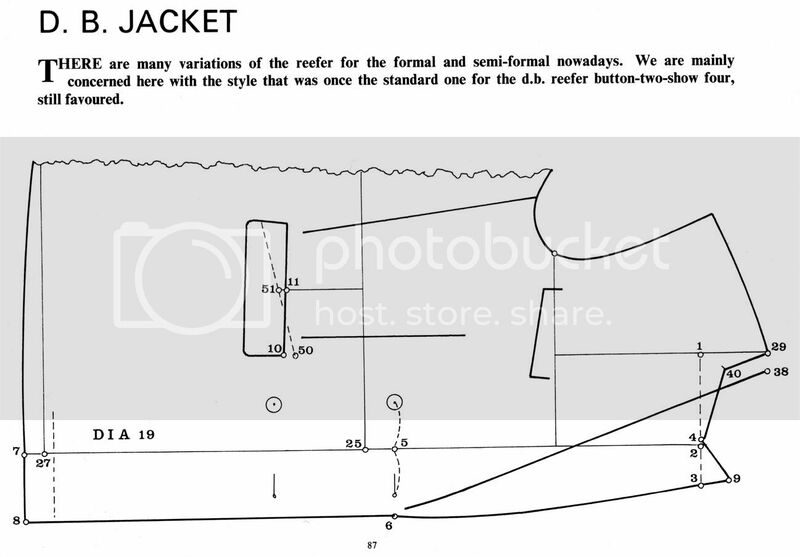 The thread on cutting double breasted "reefer" jackets can be found here. 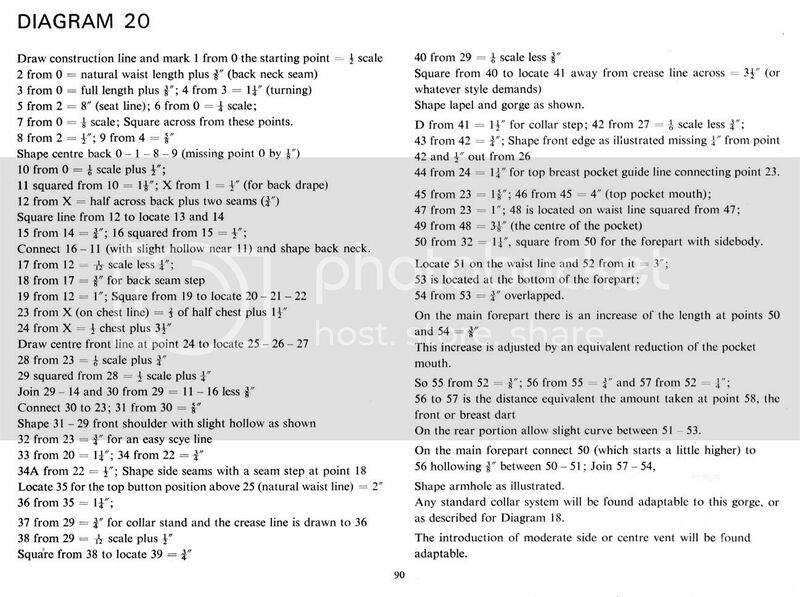 There is also another Tailor & Cutter system published around the 1940-50s or so from F.R. Morris in the Pocket CPG that can be found in this thread. 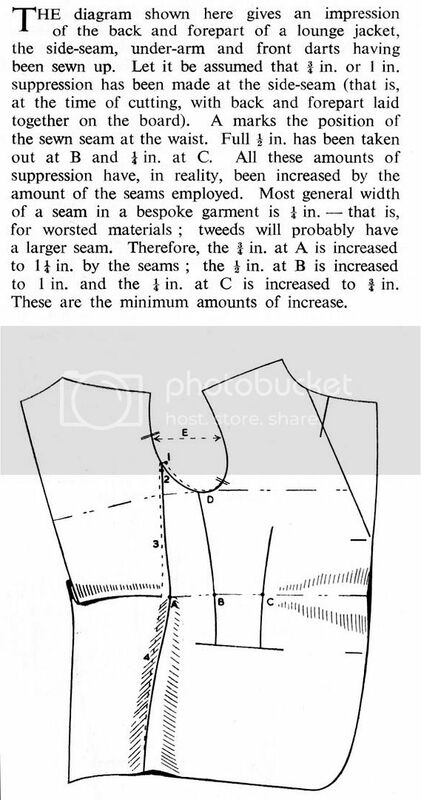 For the Morris CPG thread on cutting overcoats, see this thread. The popularity of this system is attested for by its continued publication right up till the closure of The Tailor & Cutter in the early 1970s. The earlier 1930s MTOC version by Percival Thickett can be found in this thread. Those interested in the T&C system for body coats are referred to this thread. The 1/4" front dart becomes a 3/4" front dart once sewn up if the seams are 1/4". 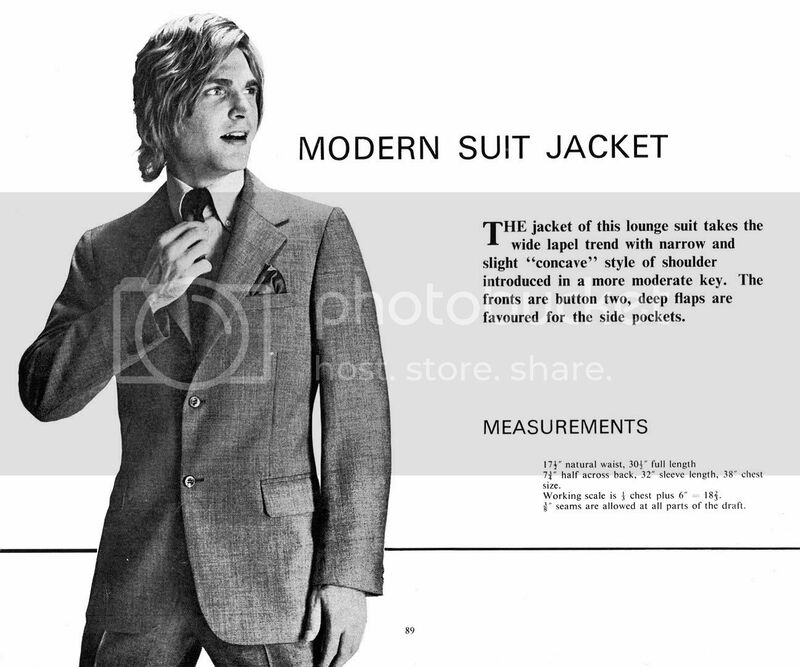 For my opinion the T&C modern suit from 1970 construction with side panel looks excellent even the sleeve. This is how a base model coat should be cut nowadays, allowances and lapels depends on taste of customer. So T&C has not always been odd and old fashion, when I see those constructions. Only one thing could be improved is that the side panel is 0.5cm to straight, but this can be fixed with the Iron work. So if you open the MTOC book from 1952 and look at the difference the conclusion is to close it and put it back on the shelf. These three plus one from a Japanese drafting book are my favorites. I don't draft precisely the same; but, I borrowed very heavily from these when defining "my" method. I want to ask, in your opinion, why is a coat without a side panel less expensive and unacceptable for an adult? I thought that side panels came from a desire/need to cut coats while economizing cloth. For some reason, I can't explain it, I prefer the look of a coat cut without a side panel. However, I wonder if this style can be used when a fitted waist is wanted. In the instructions, it mentions a side dart of 3/4". 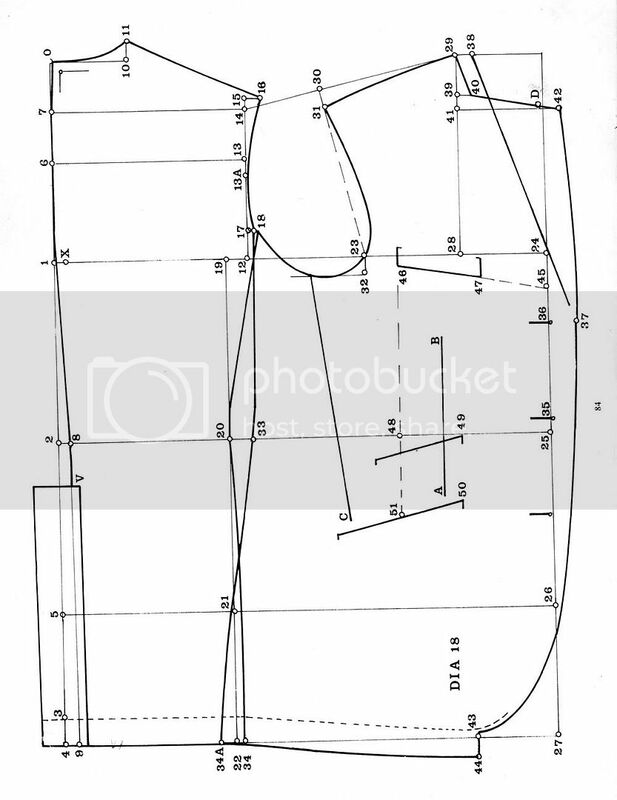 Is this what was used to shape the waist on a coat without a side panel? Edited by amateursarto, 05 March 2010 - 04:08 AM.
? 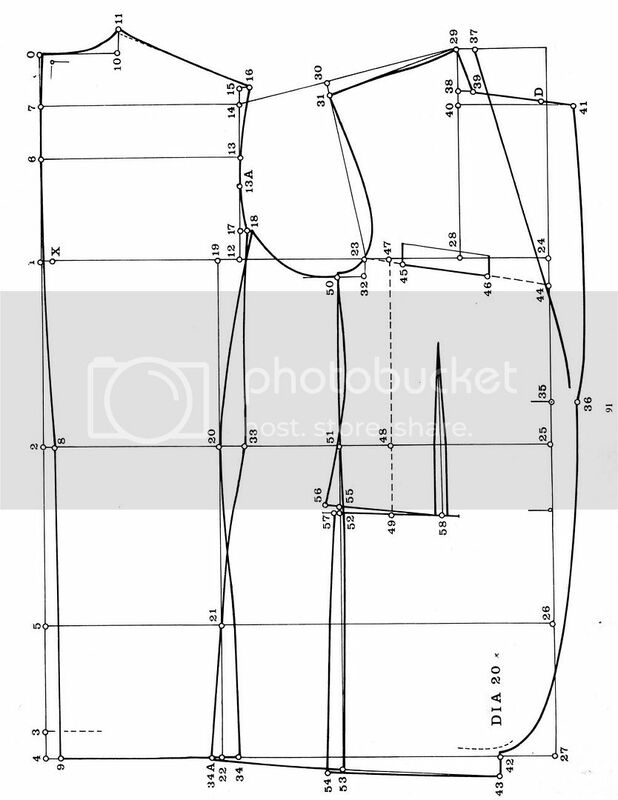 : Can the waist be shaped more by pinching in (just a bit) points 20 and 33 in the 3 button SB w/o side panel draft? You could get another 1/4" at 33, i would,nt take any more at 20. Also the side pockets are set forward for this style, normally the centre of pocket line would be found 3/4" from front of scye line, squared down. Personally i would terminate the under arm dart more towards the centre of the armhole. These are very similar to the way i draft, a good system to learn from, well balanced and no mucking about getting grain, stripes or checks to run straight. 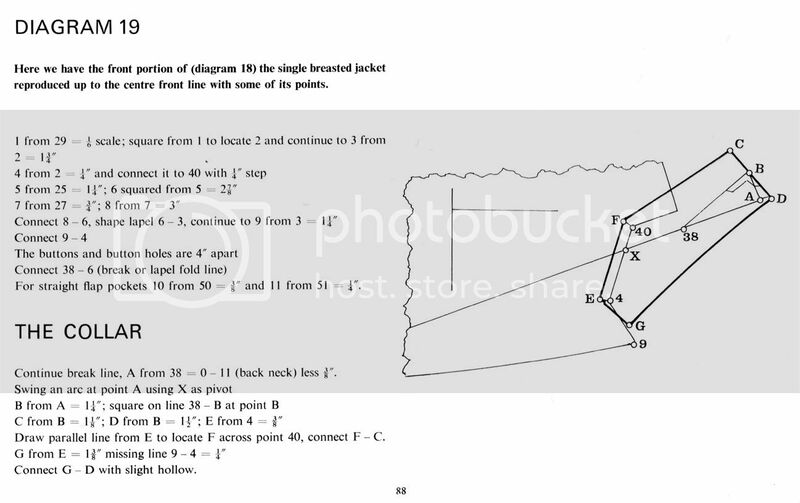 Another trick to make the jacket look more "waisted" is to raise the waist line by 1/2" to 1"
Edited by jukes, 05 March 2010 - 05:32 AM. I want to ask, in your opinion, why is a coat without a side panel less expensive and unacceptable for an adult? I too look forward reading your answer, too, Der Zuschneider, as per my book, no side dart is a no-no, but no side panel is perfectly acceptable., at least I would say it depends on the morphology of the customer, that's all. OK, "modern coats" are usually cut with side panel, but I know several bespoke tailors who like a whole front. I myself like this style, which has the "plus" of not being found in ready-to-wear garments. But I am far from having your rich experience, and I'm here to read and learn. So I hope to be wrong, so that I can learn something new today ! The only advantage of a side body (without pocket cut)is more control on the hip girth. The question i would like to ask those who swear by a side body is, Would they use a side body as much without the pocket cut ? I've begun drafting the first pattern, but before I give it a trial run, I was wondering if anyone else thinks that the armscye is a bit too deep (by about 1"/2.5 cm in my case). 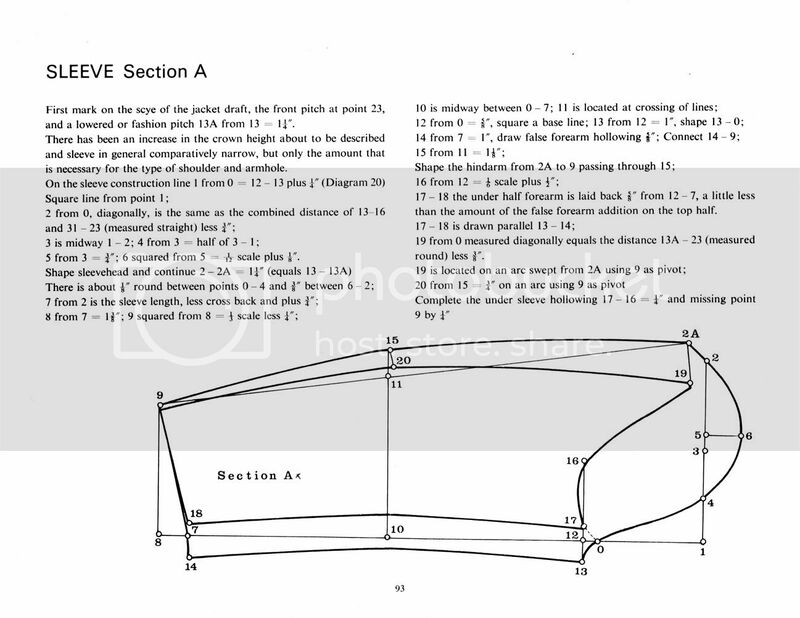 The distance from 0 to 1 is based on the scale, but would it be better if it were directly measured as a back scye depth? The armscye on these drafts have been dropped for an "easy fit" it would be prudent if you have a regular figure and want a closer armscye to not drop the armscye and clean it up at the fitting. I have just noticed that this draft is rather unclear as to how much waist suppression should be added at the front and side seams. This should give a rough idea of how much waist suppression is reasonable through the front dart, and underarm seam. Notice that Whife usually will have a seam allowance on his darts. That is a 1/4" front dart will become enlarged into a 3/4" front dart once sewn up with 1/4" seam allowance. This is in contrast to the Rundschau way of doing things where the darts are sew exactly on the chalk marks on the cloth. That is, the darts are not enlarged when sewing them up. i have drafted the 2 button coat, but i have a few questions about it. 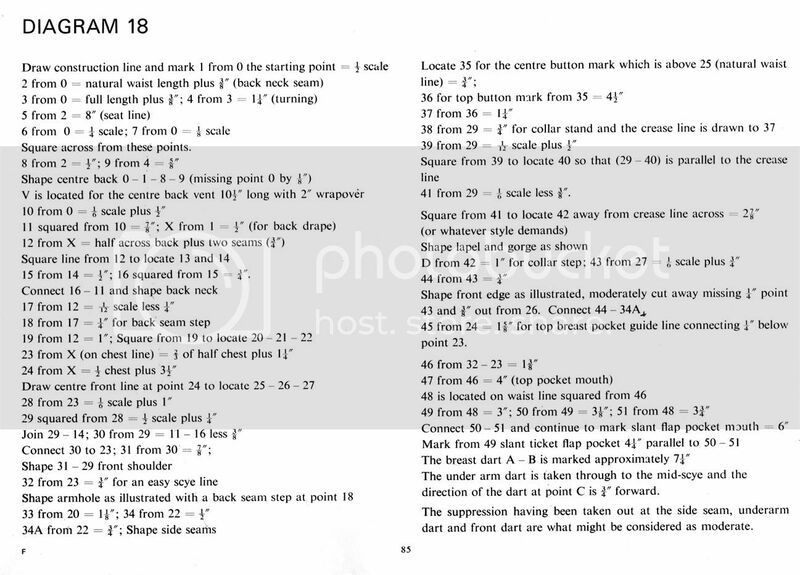 how would i go about changing the pocket from what's here to a slanted pocket with an accompanying ticket pocket? also would it be possible to modifythe gorge and collar so that its the fish mouth type like the one from the japanese fashion magazine Sator posted? thanks for your help. edit: the fish mouth gorge pic is in the les encroyables fora in the thread, ?There is beauty after al?. (i can't post a link due to the browser i'm using ). Edited by amateursarto, 13 December 2010 - 12:24 AM. Square down 3/4" from front of scye line to locate centre of pocket line 3 1/2" down from waistline. Square both ways (horizontal) using centre pocket line mark length of pocket equally both sides. Raise front of pocket 1/2" to 3/4" (depending how slanted you want them) and drop rear of pocket the same amount as front was raised. What is the ease in the chest ? Do you want to keep the same ease, just adjust the scye, or do you want a closer fit in general ? MOre to the point, what chest size are you? That scye depth is OK for the chest size given, you dont want it any smaller. I'm 43" at the chest, my waist is 36. I just don't want the coat to be boxy, (which it doesn't appear to be), but I don't want a huge armhole either. ( I see what you mean Mansie. If this scye is fine for a chest measure smaller than mine, I don't want to go any smaller). BTW, how do I figure the ease of the coat? A "slim cut" coat typically has 4-5" of ease around the girth with about 5-6" of waist suppression; and, a "boxy" coat can have as much as 8" of girth with as little as 3" waist suppression.